Another Reminder of all the Great 4th of July activities in UT. Have a Fun, Safe, 4th of July!! 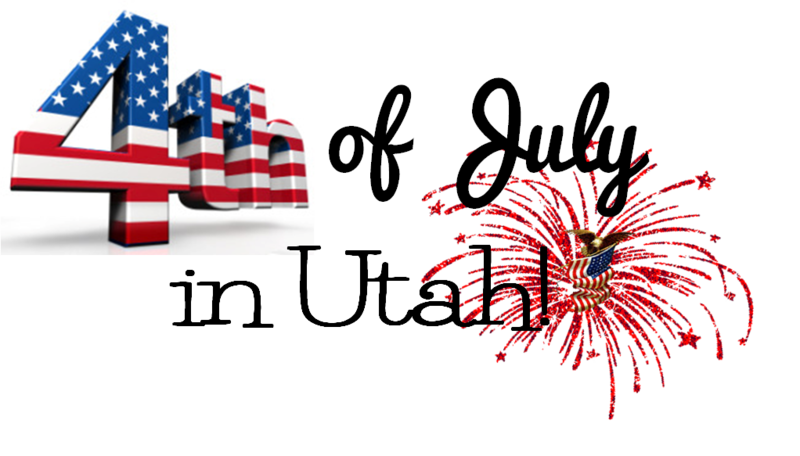 My Favorite Holiday ~ 4th of July ~ is just 2 weeks away! If you haven't yet finalized your plans for the 4th, here are some fun events happening around Utah! Access the links for specific dates and times of all the activities involved at each celebration. There are so many events happening in so many cities across Utah~ if I didn't list an event for your city, be sure to check the Utah Cities page to see if something is going on! Come up to Park City this weekend. 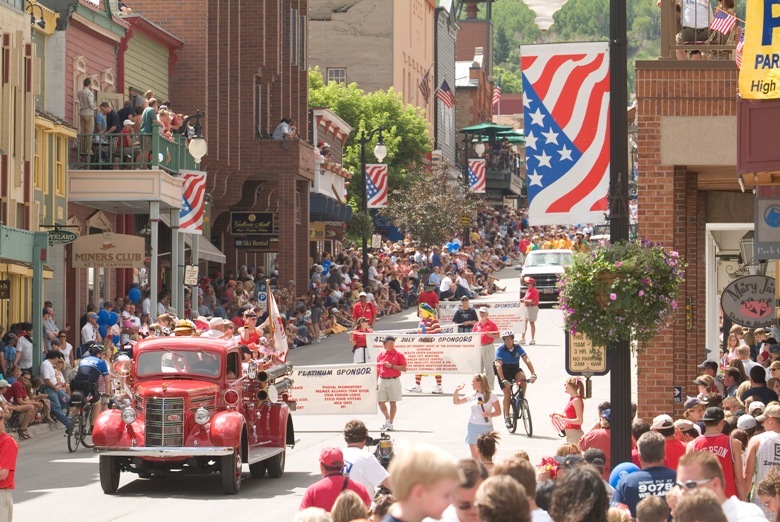 Take in a concert, catch the rodeo, and enjoy the 4th on Park City's Historic Main Street for our annual 4th of July Parade and a full day of activities, including a 5k run, pancake breakfast, parade, live music and vendors followed by fireworks at Park City Mountain Resort at dusk. Everything from a flag raising to a 5K and a 4th of July parade! Sandy 4th celebration takes place at the South Towne Promenade 10000 South 172 West, between South Towne Center and Sandy City Hall. West Jordan's Independence Day events includes a variety of family friendly events including three nights of PRCA rodeo action, Fourth of July Parade, free movie in the park on July 4th, and fireworks finale! Arena: 8035 S. 2200 W. – Park: 1985 W. 7800 S.
Celebrate tradition and change with the Sugar House Merchants Association at the 15th annual Sugar House Fourth of July Arts Festival. July 4th from 10am – 6pm. Vendors from the community and a Pet Parade! Beginning at noon, vendors will set up in Sugarhouse park, along with an inflatable playground. Live music begins at 4:00 and runs all day until 10. Fireworks display begins at 10:00. 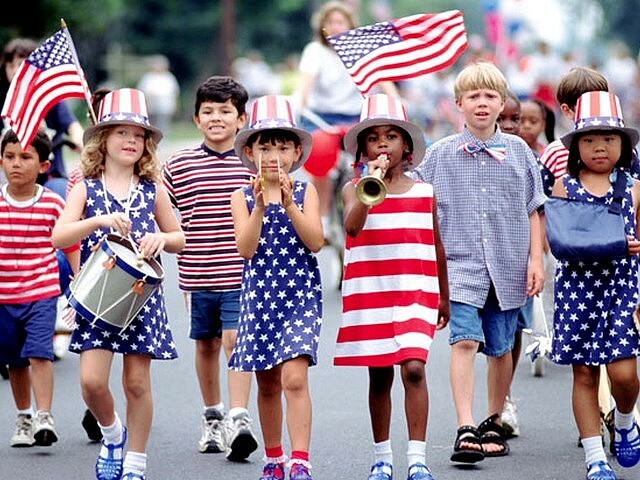 Enjoy a patriotic sunrise service, tons of free activities for kids and a parade of course! Live entertainment and a fireworks show at Murray Soft Ball Field at 10pm. 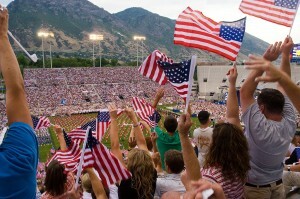 Salt Lake City's Independence Day Celebration – a tradition on SLC's west-side. Salt Lake City's annual 4th of July celebration will celebrate Independence Day in style with FIREWORKS! As always it will be a patriotic neighborhood party on Salt Lake City's west-side. Join us on July 4th for food, fun and fireworks. Events will take place at the Commons Area behind City Hall. Watch the children's parade that starts at Pine Park, Chuck Wagon Breakfast, Concert featuring Peter Breinholt and, of course, Fireworks! Lehi City and Thanksgiving Point invite you to celebrate American independence with a dazzling fireworks show. Concessions and vendors, and activities for a nominal fee will be in the park leading up to the fireworks, which are set off from Electric Park. Bring a blanket and enjoy a fun evening outdoors. Gates open at 5:30 p.m., Fireworks start at 10:00p.m. Event is free to the public. MEET HISTORY FACE TO FACE at the Seventh Annual Colonial Heritage Festival, a free three-day event for the whole family. Travel back in time through our living museum known as the Village at Aubin’s Grove at SCERA Park, and visit our indoor Colonial relics museum in room 201 at the SCERA Center for the Arts. More than 25,000 spectators will have the opportunity to experience approximately 25 of these magical giants close-up as part of the ever popular Balloon Fest. Anyone interested may attend this free event at Bulldog Field, 1100 North Freedom Boulevard, Provo. Balloons will be flying each morning from 6:30-8 a.m., July 3, 4 and 5. The event offers families and children the privilege of walking around the balloons as they inflate. Make sure and arrive at 6:30am to see the balloons inflate. Freedom Days showcases some of the region’s finest specialty products, fun hands-on activities, local entertainment, and unique foods. There is something for everyone including handcrafted jewelry, live music, kids art, books, paintings, quilts, and more! This year they are featuring Carrie Underwood! Tickets are required for the concert and the fireworks. However, you can view the fireworks from many places around town. Tooele City is excited to announce Diamond Rio in concert as part of Tooele City’s week-long 4th of July celebration! Tickets are only $5 general addmission. Fireworks after the show. Lots of activities going on for the whole family on July 3rd & 4th. Pancake Breakfast, 5k, Parade, Park Activites which include Car Show, Talent Showcase and a Pie/Watermelon Eating Contest. Free Bouncy Houses, Kids Games and Contests and lots of Food! Fireworks at 10. Are you ready to start your Independence Day one day early? If so, then head over to Canyons for our annual bash! We are pleased to announced a grander July 3rd Celebration in partnership with People's Health Clinic, the community-supported, volunteer-driven medical clinic that serves Wasatch and Summit counties. The annual Celebration festivities will kick off at 3:00pm, when the grassy area opens for guests in front of the Mountain Stage at Ski Beach. Free family-oriented music and activities throughout the Resort Village will commence at 3:00pm, including carnival games, face-painting, multiple food and beverage outlets and more. Enjoy live music that starts at 7 pm and the massive fireworks display is set to go off at approximately 9:30pm. Our annual fireworks show at Eaglewood Golf Course occurs on July 3rd each year (unless the 3rd falls on a Sunday, in which case we celebrate on Saturday). Local vendors set up around the clubhouse with food and fun. Spectators are invited to come to the golf course starting at 6:00 pm. Live music will begin at 6:30 pm. The fireworks show will begin at 10:00 pm. Layton City will host the annual Liberty Days Celebration on July 4. Events will include a 5k run/walk (Fun Run registration includes a tech style running shirt), parade, vendor booths, entertainment, the New American Philharmonic Symphony with Cannoneers at the Ed Kenley Amphitheater as well as the annual fireworks display. Join in the fun with Breakfast, 5k/10k, Parade, Booths and Entertainment from 10-9. Fireworks at dark at Davis High School. Events will be going on all day on July 3rd and 4th with the Fireworks the evening of the 3rd. Lots of fun activities going on all day! Including a Pinewood Derby, Baby Contest, Kids games, Parades, Sports Tournaments, booths and Fireworks! Lots of fun to be had at Cherry Days! ~ Flag Ceremony, Breakfast, 5k, Children's Parade, Parade, Car Show, Magic Show, Reptile Show, Festival, Concert and last but not least, Fireworks! All for FREE! I'm a little bias, but Brigham City Celebration and Fireworks rock! For a small town, they really deliver up a great Firework display at Pioneer Park. Going on throughout the day is the Eagles Breakfast, Teen's T-ball, Open Swim, Horseshoes, Family Game in the Park, Fireworks at Dark and Open Swim in the pool until Midnight! Hyrum is offering a day full of fun with races, booths, parade, Fireworks and a teen dance. They have claimed this is the biggest Fireworks show in Northern UT! July 3rd at 8:00 pm at Romney Stadium. Tickets are required for $8 or 6 for $36. If you don't want to go the Ticket route, you can still enjoy the fireworks from other locations around town. Southern UT ~ St. George, Cedar City, etc. Check out Utah Dixie Deals for all the fun happening for the 4th and 24th! Friday Freebies ~ Comet and Bear Naked Energy Bar! How to use the Smith’s Food & Drug App–Digital Coupons made easy!